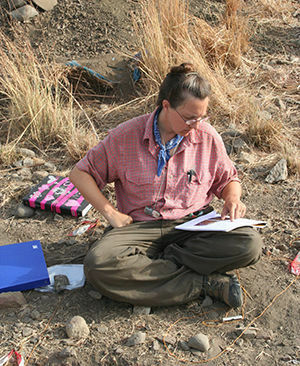 Meredith Chesson, an associate professor in Notre Dame’s Department of Anthropology, has been awarded a three-year grant from the National Endowment for the Humanities to continue fieldwork in Italy’s Bova Marina region. Her project—examining how human landscapes of the Mediterranean have changed over millennia—is an outgrowth of 18 years of research by the Bova Marina Archaeological Project (BMAP). The project is co-directed by Chesson, John Robb of the University of Cambridge, and Lin Foxhall of the University of Leicester, working under the auspices of the Soprintendenza per i Beni Archeologici della Calabria. The new work, titled The Political Logic of a Mediterranean Landscape, will be conducted by a cross-disciplinary team of prehistorians, Classical and historical archaeologists, geoarchaeologists, ethnographers, and ethnoarchaeologists. They will focus on southernmost Calabria, a region in southern Italy, from 6000 B.C. to the present. “We are seeking to understand why and how people changed their social and physical geographies to suit their needs over an 8,000-year period and, whenever possible, we will strive to understand it from the local perspective,” said Chesson, who has worked with BMAP since 2007. In combining almost 20 years of excavation, survey, and ethnography, Chesson said, the researchers hope to answer two major questions: How have humans defined a social landscape and inhabited it during the long span between the establishment of the first farming communities and the present? And how is that human landscape generated not only by geography, ecological conditions, and macro-politics but also by local, bottom-up forms of practical political logic? This summer, the project team will conduct a standing architectural survey in order to learn about buildings, industries, irrigation, and field systems from the early 19th to mid-20th centuries. They will also begin making local contacts in order to conduct ethnographic interviews and collect oral histories during next year’s season of fieldwork. “We hope to document post-medieval settlements, structures, and lifeways in the San Pasquale valley, ultimately weaving together archaeology, architectural survey, historical documentation, and oral histories and ethnography,” Chesson said. More surveys will be conducted next summer, as well as test excavations at promising sites and interviews with locals, Chesson said. Next year, Chesson will take a sabbatical to finalize publication of the results of recent BMAP excavations of the Sant’Aniceto site in southern Italy. She will also explore ways to share her research with her students at Notre Dame. “I always design courses to give some space for me to talk about my research in class,” Chesson said. Since 2001, she has brought Notre Dame undergraduates to field sites in Jordan, Ireland, and Italy. “Teaching in the field is a joy, and the field context allows the archaeology to come alive for our students in a very intense manner,” she said. Originally published by Aaron Smith at al.nd.edu on May 05, 2015.